The Doha climate talks (COP18) reached an agreement on Saturday night. They’re calling it the “Doha Climate Gateway”. To me it looks like a gateway to probable inaction and climate catastrophe. Delegates blatantly ignored the urgent warnings being screamed at them from all directions, and put off consideration of ramping up ambition until next year, or the one after that. They agreed an extension of Kyoto with meaninglessly weak 2020 targets and enough carried-over surplus permits to lock in business-as-usual for many countries until at least 2020. They failed to agree a pathway for global emissions or significant finance for poor countries. Meanwhile, our governments still expect us to wait until 2020 for a possible global binding regime. In the showdown between developed countries and small island states in Doha, rich countries won hands down. Ultimately, we all lose. One of the most depressing parts of humanity’s annual cycle of procrastination on the climate crisis is that after the conference fails to achieve much of significance, 195 government spin machines kick into action to sell the outcome as a step forward. This time the main justification is that Doha “crossed the bridge” to a new regime. Ministers say things like “where would we be if we had failed to agree and the process had collapsed?” While of course I don’t want the climate talks to collapse, I don’t think it has ever been likely and it occurs to me that it would have a bright side: there would no longer be a false sense of security that the climate crisis is being addressed. The message that progress is being made is seductive to those of us desperate for climate action, but one we must see through. After the high-profile failure of Copenhagen, governments have gone into Cancun, Durban, and Doha conveying low expectations, which in many cases I suspect was a deliberate public relations strategy so that at any hint of incremental progress they could reemerge proclaiming they met or exceeded those expectations. It’s a psychological manipulation technique called “under-promise and over-deliver”. Judging outcomes relative to the expectations governments set for themselves is playing into the hands of the delayers. Instead outcomes must be judged on real-world merit, and in this context the Doha Climate Gateway is worse than nothing. The climate talks have gone on my entire life, yet despite the negotiators’ constant claims they are making progress, the situation has deteriorated at an accelerating rate. Global fossil fuel CO2 emissions have risen by 58% since 1990 and 2.6% this year (with most of the recent growth in China), and the Earth is headed for a catastrophic 4-6°C global warming by 2100, plus potentially large feedbacks and post-2100 warming. If we allow anywhere near that level of warming, humanity faces a very uncertain future. To be sure of preserving a habitable climate and avoiding feedbacks that could send climate change spiraling out of our control, we must aim to reduce CO2 to ~350 ppm (limiting warming to ~1°C). That means we must phase out fossil fuels globally as fast as possible. Politically, this has never looked more impossible. Let’s go through the outcomes, by negotiation stream, in the order I prioritized them beforehand. What Doha delivered: Ambition was the elephant in the room, sidelined in favor of competing negotiating streams. The ADP outcome did no more than plan future negotiations – what a waste of 12 months! It decides “to identify and explore in 2013 options for a range of actions that can close the pre-2020 ambition gap with a view to identifying further activities for its plan of work in 2014 ensuring the highest possible mitigation efforts under the Convention”. I am pleased this time the decision clearly specifies pre-2020, but the vague timeline inspires little confidence that governments will treat 2014 as a solid deadline for ramping up ambition, let alone closing the gap. Any increase in pre-2020 ambition would remain non-binding for countries outside Kyoto. For some reason, a mention in a draft decision of sector-specific ambition was removed. No major emitters made new emissions pledges or increased the inadequate ones they made in 2009 (though to their credit Monaco and the Dominican Republic did). If anything ambition went backwards in Doha, with some countries backing away from their existing pledges, as we shall see. What Doha delivered: Delegates officially closed Kyoto 2 negotiations, amending the Kyoto Protocol to create a second period beginning next year. Kyoto 2 institutionalizes meaningless targets for its few remaining participants, further diluted by loopholes. Countries that will have binding targets under Kyoto 2 encompass only 14% of global emissions: the 27 members of the EU, Australia, Ukraine, Kazakhstan, Belarus, Switzerland, Norway, Croatia, Iceland, Liechtenstein, and Monaco. The US, Russia, Japan, Canada, Turkey, and New Zealand are out; their excuse is Kyoto excludes developing countries, a complaint hard to take seriously coming from countries refusing to be covered themselves. Kyoto 2 will drag on until 2020, with mostly the same pathetic targets pledged in 2009; the aggregate target is only 18% below 1990. Several countries say they remain open to moving to the high end of the ranges they pledged in 2009, but their conditions for doing so will not be binding. Fortunately those targets are not set in stone: in 2014 there will be a ministerial roundtable where each party “may” raise its ambition toward at least 25-40% below 1990 by 2020. However, I fear the targets set in Doha will now be seen as the default pathway. If future meetings fail to raise ambition, what emissions cuts will Kyoto deliver? Ukraine’s, Kazakhstan’s, and Belarus’s targets to “cut” their emissions relative to 1990 actually allow their emissions to rise because their present levels are far below 1990 (in Doha, Kazakhstan further weakened its target). The EU’s target of 20% below 1990 has already been achieved in 2012, allowing eight years of inaction. Croatia and Iceland intend to meet their targets jointly with the EU, and Australia will link to the EU ETS. Australia’s target is a mere 0.5%below 1990 averaged over 2013-2020 (equivalent to 5% below 2000 in 2020). The most ambitious Kyoto targets are Switzerland’s 15.8% below 1990 during 2013-2020 (20% below 1990 in 2020), Liechtenstein’s 16% below 1990 during 2013-2020 (20% below 1990 in 2020), Norway’s 16% below 1990 during 2013-2020 (30% below 1990 in 2020), and Monaco’s 22% below 1990 during 2013-2020 (30% below 1990 in 2020). These four countries bound to make real emissions cuts account for less than 1% of global emissions. These targets are further diluted by a long list of loopholes including offsets, land-use creative accounting, and surplus permits. Australia refused to sign up to Kyoto 2 unless these loopholes were preserved, and appears to have secured everything it wanted (though as we shall see, the role Australia played on surplus permits is complex and surprising). The “Australia clause”, which allows creative accounting on land use, remains in effect. Kyoto’s market mechanisms remain in operation, allowing rich countries to avoid decarbonizing at home by importing dubious offsets (indeed, this seems to be Australia’s main motivation for staying in Kyoto). This Wednesday, the prices of two types of Kyoto offsets crashed to record lows (15 cents and 31 cents respectively). Fortunately, despite the efforts of New Zealand, they will no longer be accessible to countries not bound by Kyoto 2. Strangely, New Zealand climate change minister Tim Groser claims they will stay open until 2016, something I can’t find in the decision. Either way, the LCA decision agrees to develop a global market mechanism which would presumably be open to all countries. Countries with surplus permits from the first period can choose to carry them over (three guesses what choice they’re likely to make), albeit only if they have second period targets. I hope that means Russia will lose its surplus, the majority of the world’s, but others with sizeable surpluses will keep them. Much has been made of the decision that countries will be allowed to trade only 2% of their surplus permits, and the promise to not buy them by the EU, Australia, Japan, Liechtenstein, Monaco, Norway, and Switzerland. But what is far more important than such trade restrictions is that countries will be allowed to use their surplus permits to meet their targets, sabotaging not only Kyoto but potentially also a post-2020 regime. In the final hours of Doha, the negotiations stalled when it transpired Russia, Poland, Ukraine, Kazakhstan, Belarus, and Australia – all countries with surplus permits – had neglected to submit the relevant paperwork. EU ministers retreated to another room to persuade Poland to support the text, while Australia (as leader of the Umbrella Group) persuaded Ukraine, Kazakhstan, and Belarus. They succeeded in isolating Russia, and the Qatari COP18 President gaveled through all the decisions at 7pm Saturday, ignoring Russia’s objections. Then UN climate chief Christiana Figueres claimed what Russia wanted is actually in the decision that was adopted. The Kyoto amendment is not legal yet, and the decision merely “recognizes” countries “may” provisionally apply it before it is ratified and legally enters into force. I am pleased that targets in the second period, after being oddly referred to as “objectives” in Durban, are now again called “commitments”, removing any ambiguity about whether they are legally equivalent to targets in the first commitment period. But even the original Kyoto was evidently not sufficiently enforceable, because Canada was able to completely flout its target and drop out last year without consequences. As far as I am aware, there is nothing to prevent such a situation recurring in the second period. Indeed, Ukraine, Kazakhstan, and Belarus are already considering not ratifying the amendment because of a clause added by AOSIS penalizing countries who do not cut emissions below 2008-2010 levels. What Doha delivered: Delegates officially closed LCA negotiations, and the content of the decision is similarly underwhelming to Kyoto 2. It fails to specify a timeframe for peaking and declining global emissions; launches a review which is intended to assess progress toward existing voluntary pledges and consider raising ambition but will not be completed until 2015; fails to even mention accounting rules (apparently because the US, Canada, and New Zealand blocked progress on the topic); plans a new market mechanism; fails to agree on intellectual property; and handballs unresolved issues on assisting poor countries to institutions like the Green Climate Fund. Voluntary pledges for 2020 remain inadequate. The US and Canada have each pledged to cut their emissions 17% below 2005, equivalent to returning to around 1990 levels. In Doha Russia backed away from its pledge to “cut” its emissions 25% relative to 1990, which in any case allows its emissions to rise from their present level of 34% below 1990. Japan has made no unconditional pledge and Turkey no pledge at all. New Zealand has pledged 10% below 1990. Of big developing emitters, only South Korea has pledged an unconditional absolute emissions cut. China’s emissions are set to grow from 10 Gt CO2e today to 11-14 Gt in 2020, India’s from 2 Gt to 3-5 Gt, Iran and Saudi Arabia have not made pledges, South Africa is unlikely to meet its pledge to approximately stabilize its emissions, Mexico and Brazil have pledged absolute emissions cuts conditional on finance, and Indonesia’s emissions (mostly from forestry) are highly uncertain. Small island states are leading the world, pledging to cut their emissions by a collective 45% by 2030. In Doha the Dominican Republic pledged 25% below 2010 by 2030. There was minimal progress on climate finance for developing countries, with several European countries making pledges totaling US$6 billion over the next three years. Developing countries wanted US$60 billion per year which, they pointed out, is the same amount Obama is seeking from Congress to deal with a single storm, Hurricane Sandy. Yet in Doha the richest countries in the world cried poor because of the global financial crisis, and Canada said it will not provide any climate finance until there is a global agreement. The LCA decision merely “urges” rich countries to “announce climate finance pledges when their financial circumstances permit” and “encourages” just US$10 billion per year, while “reaffirming” their promise, now described as a “goal”, to scale up finance to US$100 billion per year by 2020. This is getting ridiculous. A surprise victory by developing countries was an agreement acknowledging a need to talk about loss and damage, and agreeing to establish at COP19 a mechanism to address it. The US, Australia, and Canada fought hard against it, concerned it could open up rich countries to litigation. US delegate Todd Stern was allegedly overheard saying: “I will block this. I will shut this down.” Small island states threatened to walk out if they did, saying the reason loss and damage is now being discussed is because rich countries have refused to cut their emissions. In the end the US made certain the decision did not include the word “compensation” or imply legal liability. Though thin on detail, it is important in that it opens the door. I’m not sure what I think about the issue of loss and damage. I too am leery of potentially unlimited compensation claims. While I agree we rich countries have some obligation to help developing countries deal with a problem we caused, I don’t want my country to bankrupt itself in the process. If anyone must pay for loss and damage, it should be fossil fuel companies. In any case, we should never have let global warming get to the stage where loss and damage is being discussed – yet another reason it is time to finally wake up and cut our emissions. What Doha delivered: As with its other workstream, the ADP outcome did no more than plan future negotiations. Last year’s promise to agree a possibly binding global regime “as early as possible but no later than 2015” is now definitely delayed until COP21 in 2015, and the implementation date remains 2020, which the UN itself says is too late to wait. Negotiations will continue at COP19 in 2013 and one or more interim conferences between now and then, and world leaders will attend COP20 in 2014 so a negotiating text can be available by May 2015. There is still no clarity on the legal form or content of the post-2020 regime. We don’t know how much legal force the outcome will have, or whether all countries will be equally bound, or how it will apply differently to rich and poor countries, or even whether it will include emissions targets. There were tantalizing signs the US might be shifting in its willingness to negotiate on the interpretation of “common but differentiated responsibilities”, though the ADP decision again contained no mention of the principle. The US and several other countries agreed to act through a Climate and Clean Air Coalition (CCAC) to cut short-lived climate pollutants, which are more powerful at trapping heat than carbon dioxide but do not linger in the atmosphere for as long (including methane, soot, ozone, and hydrofluorocarbons). This is good as far as it goes, but should not be considered a substitute for urgently phasing out fossil fuel CO2 emissions, a proportion of which will stay in the atmosphere for millennia. Who were the heroes and villains of Doha? Russia, Poland, Ukraine, Kazakhstan, and Belarus insisted on keeping surplus permits and growing their emissions. The US, Canada, Russia, Japan, and New Zealand refused to raise their ambition or be bound by Kyoto, while continuing to play a blocking role on many issues. The US mostly stuck to its traditional obstructionism, though later appeared to soften slightly on CBDR. The EU and Australia refused to raise their ambition and took on meaningless Kyoto targets. The EU allowed itself to be held ransom by Poland, though some European countries made finance pledges. Australia advocated loopholes. However, the EU and Australia ultimately tried to isolate Russia. Big developing emitters kept a low profile. They demanded ambition from rich countries, but like the rich countries they did nothing to raise their own ambition. Qatar does not seem to have been a very helpful host. Seriously, why was such a fossil-fuelled country selected to host COP18? Small island states strongly advocated real ambition, plus loss and damage. The Climate Action Network (CAN), which keeps delegations accountable with “Fossil of the Day” awards, gave New Zealand the year’s “Colossal Fossil” award. New Zealand won 5 Fossils, followed by the US (5), Canada (4), the EU (2), Poland (2), Russia (2), Japan (2), Qatar (1), and Turkey (1). As was the case last year, I am frustrated Australia was not awarded any Fossils; while I’m sure there are plenty of candidates to choose from, I wish Australia’s fossil-addiction would get more attention. The principle of “common but differentiated responsibilities” (CBDR) acknowledges developed countries are responsible for the majority of carbon already in the atmosphere, have high per capita emissions, and have the means to act, obliging them to cut emissions first and fastest and help poor countries follow in their footsteps. I support this principle and oppose the unjust anti-CBDR position of the US and many other rich countries. However, the hardline developing country position, now personified by the Like Minded Developing Countries (LMDC), has become equally unhelpful. The LMDC demands rich countries take on ambitious binding targets without loopholes while poor countries are allowed to continue growing their emissions. Developing countries have legitimate grievances. They are by definition poor and most have low per capita emissions. Developed countries have flouted their obligations to lead or even to keep their promises. Rich countries are acting inequitably, but both they and big developing emitters are acting inconsistently with intergenerational justice. As Nicholas Stern put it recently, arithmetic demands that emerging economies act. The majority of annual emissions now originate from developing countries; China in particular is responsible for 28% of global emissions, its per capita emissions are about to overtake the EU’s, and its emissions are growing by 10% per year. 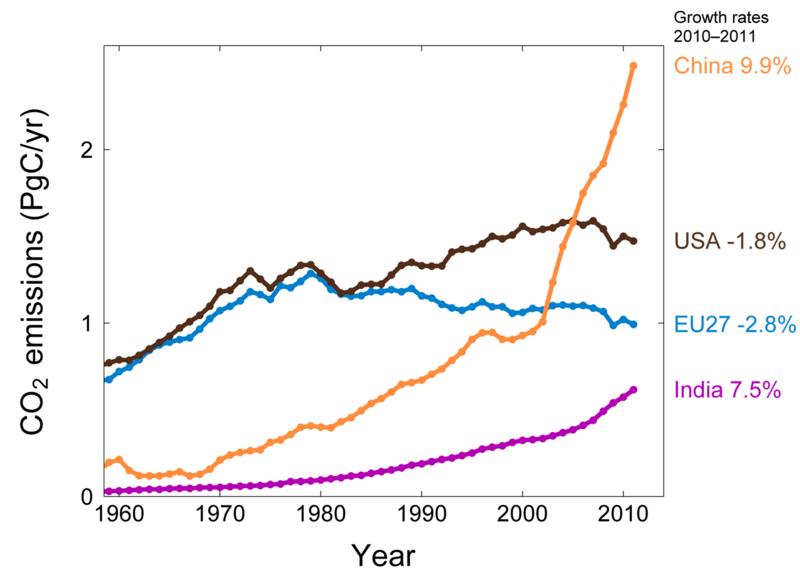 Even the cumulative emissions of developing countries are projected to overtake developed countries within a few years. The situation is so urgent that all countries’ emissions must peak and decline as soon as possible so global emissions can approach zero. Of course, I’m not saying poor countries should cut emissions as fast as rich ones. Rich countries should rapidly decarbonize their economies to buy some time for the emerging economies, but for sustained deep reductions in global emissions China and other large developing emitters must also start making absolute emissions cuts very soon. Maybe rich countries can help to pay for it, but the cuts must be made. Many environmental groups back the LMDC position, yet it increasingly looks like an attempt to perpetuate deadlock rather than advance action, especially considering the LMDC’s membership includes China, India, and oil-producing states. As important as justice is, sticking to entrenched positions will not save the climate. We don’t have time to argue about it. The two sides on CBDR need to meet in the middle. We cannot compromise on ambition; we must compromise on CBDR. As I said after Durban, the present system of voluntary pledges will not work. Ambition is unlikely to be determined by science, with most countries continuing to cite the inaction of others as cover for their own. We need a global binding treaty which decides on a top-down target, preferably 350 ppm, and divides it up among all nations. A global problem requires a global solution. And the UN process is the only forum giving a voice to the greatest advocates of action, the small island states. Having said that, since the climate talks have postponed a global treaty until it will be too late, radical unilateral action is needed to get a momentum for multilateral agreement. Willing countries should not limit themselves to pursuing a top-down treaty and implementing their inadequate existing targets, but instead use every lever at their disposal to accelerate climate action from the bottom up. Australia should aim for zero emissions unconditional on international action, start phasing out its fossil fuel exports, and play a constructive role in climate talks. It is clear that what is holding back ambition in global climate talks is the fossil fuel lobby’s stranglehold on the domestic politics of most countries. Instead of democratic government by the people for the people, we have undemocratic government by the corporations for the corporations. Business lobbyists have privileged access to the political system, and the fossil fuel industry is using it to sabotage climate policies. People power is urgently needed to counter corporate power. We must find ways to reduce and counter the influence of money in politics, and demand radical climate action from our governments. We cannot sit and wait for the politicians to decide our future. We must pressure our governments to close the ambition gap at COP19… in Warsaw, Poland.